What are the right questions to ask during an in-person interview, in order to get true insight into the candidates professional experiences, successes, failures, motivations, inspirations and personality? The in-person interview should be a time where the hiring manger and team can spend quality time getting a sense of the candidates professional experiences and personality to see if their background will be a good fit for the role in question and if they will be a culture fit for the organization and department. So how is it done? ‘Behavioral based’ interview questions are one of the more recommended ways to gain ‘real’ insights into what the candidate has done, how they have reacted in certain situations in the past and how they will react in the future, etc. However, I feel that most candidates can generally pull out one decent experience to share, so what I recommend is using is an interview format that is part ‘behavioral based and part life story’. This will allow the candidates to really get comfortable talking about past experiences and will allow them share several examples or scenarios related to the question on hand. Treasure Search Partners “3 Part guide” on how to interview your candidate. 1) Getting to know the candidate. Current role overview/ what motivates them/ what are they passionate about / what are they personal goals they want to accomplish in their current role. What led you in to the career / positions you have held to date? …..Bring me through your career progression and choice of these roles / organizations? Are you from the Bay Area? What brought you to SF? Where did you go to school / college? Did you like it? What were some of the major influences you experienced during this time ? What do you like to do for fun? Do you have a balanced lifestyle ? How to you try to keep balance? What have you done to become more effective in your role and improve overall performance over the years? The second part of the interview allows the hiring manager and team to ask and learn about the candidates’, past experiences, relationships, situations, both positive and negative, successful and failed outcomes. It also should give insights into the candidates decision making process. These types of questions should give solid insights into how this candidates will react, deal and manage in situations and in relationships that they will be asked to deal with in the role for which they are interviewing. The following questions can be asked in reference to any number of positions and roles the candidate has held. Were there any key turning points in this project /initiative? What were the key relationships that mattered most? How did you develop / nurture them? What were the key sources of support or resistance you encountered? Tell me about some of the relationships that you had to interface and deal with that were challenging? What was most difficult or challenging? (specific examples?) What did you do to deal with these challenges? What was the outcome? Do you view your contributions as successful? In what ways? What specifically was accomplished? What risks did you take in your last role? What were some of the biggest lessons learned from your last 2 roles? Describe yourself going into your last role and now? What is different? Share 3 times when you had to over come challenges in your role with team-mates etc. What was the most useful criticism you ever received and did it change or how did it change the way you worked? What were the personal traits and skills that helped you succeed in your current / last roles? Where and how did you learn those skills? Share one critical component that you were responsible for executing? Share an example of a time when you needed to develop a new internal or external relationship? Share a example of a time when the internal /external client /partner was never available for meeting etc. What did you do ? What did you learn? How do you ensure you customers/ internal clients are satisfied? What career path have you established for yourself and how does this role fit into your plans? How do you measure success on the job? What keeps you challenged and motivated ? Tell me about a time when you had to introduce change into your dept. ? How did you deal with resistance? Have you ever disagreed with your manager- how did you communicate this? Who was the best manager you ever had and why? What style of management do you prefer? 3) Why us ? Why you? 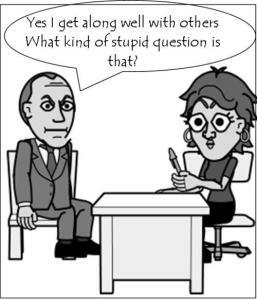 The third part of the interview is often the part that separates the A’ candidates from the B’ candidates. We deep dive and find out how much time they have spent researching our organization, products and services? What are their opinions or what ideas or suggestions do they have on our products / services etc. What interests you most about this opportunity specifically and our organization? Based on your knowledge of our industry / competitors what are our companies greatest advantages and weakness? What sort of trends do you think affect our ind.? What are the first things you would like to accomplish in this role? I hope you have found our “3 Part guide’ on how to conduct a great interview helpful. If you did, feel free to ‘like us’ and follow us, and we can make sure to share our next blog post with you. There are many, many methods and questions that that one can use, but the ones I have noted above I have found to be the most telling as I look to recruit the A’ tier candidates for my clients and help them chose the very best candidate for their organization and team.